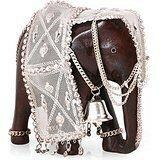 Elephants and Feng Shui Elephants are often used in Feng Shui to energize certain areas of the home and for good luck. The elephant is associated with Buddha and the Indian deity Ganesh and can be used to symbolize power, wisdom, strength, protection of the home, fertility, and general good luck. Work success Place an elephant near the front door or the door of the office to attract power and to protect the person from bad energy in the office. Size : 5 Inches Height X 5.5 Inches wide X 2 Inches depth. Weight : 0.35 Kg Material : Wooden. -------------- Pls beware from Copy product & ensure buying authentic product. This is exclusive inhouse design & product of Brand " Collectible India" and "covered by intellectual property rights laws". 'Collectible India' do not authorize any other Brand/Seller to sell it and we won't be responsible if any counterfeit or substandard product send by any other seller.